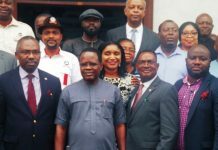 Chairman, Rivers State Council of the Nigeria Union of Journalists (NUJ), Mr Stanley Job Stanley, consoling the wife of the late former General Manager of Rivers State Newspaper Corporation, Pastor Augustine Nwikinaka, during a condolence visit by members of the State Working Committee of the union in Port Harcourt, yesterday. The Rivers State Governor, Chief Nyesom Wike has declared that the refusal of President Muhammadu Buhari to sign the amended Electoral Act was part of the plot to rig the 2019 elections. 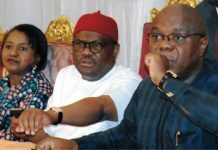 In an interview at the Government House, Port Harcourt, Wike stated that the plot by the APC Federal Government was basically to write results against the wishes of Nigerians. He said: “Why has the President not signed the Electoral Act? What is the fear? What do you mean by mistakes? Oh my God what is a mistake? Errors you didn’t see by one month’s time? Errors for the first time, the second time, the third time. Does it not tell Nigerians these people are not prepared for election? Wike noted that the APC Federal Government and the security agencies would not succeed in rigging the elections in Rivers State. Wike explained that intelligence at the disposal of the Rivers State Government indicates that indicted SARS Commander, ACP Akin Fakorede and DCP Stephen Hasso feature prominently in the rigging plot of the APC-led Federal Government in the state. He said: “They are planning for Rivers State as I speak. Let me tell you. They are promoting my Commissioner of Police to Assistant Inspector-General of Police, they are promoting the Deputy Commissioner of Police, who was just made a Deputy Commissioner of Police (Operations) to be Acting Commissioner of Police and the SARS man who took Rivers State Government to court, who has perpetrated rigging of election even by INEC report, they are going to make him the man in charge of operations just for the purpose of 2019 elections. 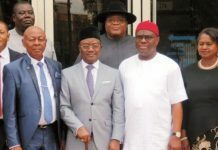 The governor said that the international community was under obligation to take proactive action against officials of the APC-led Federal Government who destroyed the foundation of democracy and the rule of law, and called for the revocation of their visas. “If it were where things are done rightly, they should revoke all the visas of those in government who are opposed to democratic rule principles, rule of law. Let me tell you whether you like it or not, this government is bent on eliminating the key opposition”. 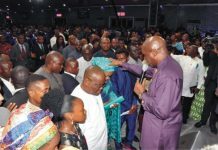 He stated that the electoral criminality plotted by the APC-led Federal Government was exhibited during the cancelled Port Harcourt State Constituency three election where security agencies and APC thugs were unleashed on the constituents. 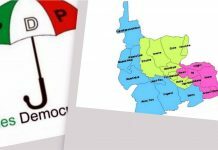 The governor said: “Look at the bye-election in Port Harcourt Constituency three comprising eight wards, 142 polling units within the same area. It is a ring road like this; it will not take you thirty minutes to cover them. The Commissioner of Police as I speak to you since after the election has not seen me to explain to me why all the atrocities were perpetrated, snatching electoral materials, and beating INEC officials. 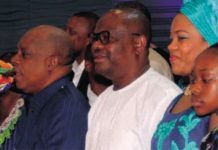 Wike noted that the APC-led Federal Government plots to use security agencies to promote mass violence across Rivers State on the day of the governorship election in 2019, so that it would be postponed for them to have time to invade the state with hundreds of thousands of security personnel for rigging purposes. “First of all, as far as 2019 election is concerned, there will be no election. The security agencies will help them to show that there is so many crises in the entire local governments, shooting everywhere and then they will postpone the election. When they postpone the election, then they will now bring down all their security agencies to the Rivers election”. Wike further explained the modalities for the planned rigging by the APC-led Federal Government. “We know, we have people inside the system who also working with them who are also letting us know these are the plans they are hatching and it has been happening. Port Harcourt showed it, I told my people don’t do anything. “Allow them to show their hands and they did by coming with criminals and SARS wearing their uniforms. SARS protected them to cart away materials. INEC REC from Akwa Ibom, not Rivers State INEC, from Akwa Ibom, one of the three RECs that were sent here said, he saw, he witnessed, he couldn’t believe it. That at this our time, security agencies will lead people to cart away materials. So, for 2019, it is to make sure no election takes place in the first instance. Wike berated the APC for selecting a murder suspect as one of their factional chairmen in Rivers State and ordering security agencies to protect him. He said: “A man who is facing multiple murder trials, the court said, he must be arrested for murder, ordered the Commissioner of Police to arrest him. They say, they can’t find the man but the man is the one who will come out and say, he’s contesting for the Chairman of the APC? What a shame to this country, what a shame to the security agency. They should bury their heads in shame.